And we want your help! Sponsors of Alliance of Channel Women receive visibility from our members through multiple ways. Most prominent are our events at Channel Partners and Channel Partner Evolution. We host at least 200 women the night before the first day of the show with a panel, speaker, workshop, or other engaging activity. We encourage you to become a sponsor and show support for the women in your organization as well as the women you want to reach. Many service provider, carrier leaders, and top agent partners are active members. As a group, Alliance of Channel Women is the fastest growing organization in the Channel. 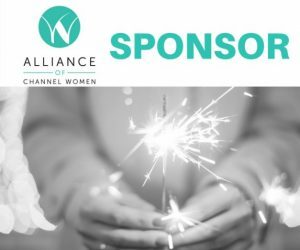 Why Sponsor Alliance of Channel Women? 1. We are the only networking group oriented towards women in revenue generating roles in the communications and IT space. 2. Our education teams provide topical programming oriented around helping our members achieve greater success. 3. Our outreach program extends into other women’s organizations and businesses. We are working to raise the next generation of female leaders in the channel. 4. Your sponsorship shows your organizations commitment to diversity. Your HR teams can use our logo in your recruitment efforts for as long as you are a sponsor. 5. Our sponsorship program puts you in front of some of the largest revenue producers in the industry! 6. Alliance of Channel Women’s growing membership has more than 260 paid members and companies, representing 85 companies and 2300+ LinkedIn group members. Your sponsorship puts your brand in front of this active community. 7. We conduct 12 conference calls/year and each one is an opportunity to promote your organization. 8. We hold 2 semi-annual networking and enrichment events with industry thought leaders and a growing number of local events, all with opportunities to promote your brand. 9. We offer a robust blogging and messaging platform for our top tier sponsors. Interested in sponsorship? Check out our sponsorship packages, and contact us at sponsorship@allianceofchannelwomen.org.